Originally built in 1962, this 4-acre property consists of 5 buildings with a total of 120 units and a 45,000 gallon outdoor pool. Come relax and enjoy your stay in our clean, comfortable, and charming hotel. We offer various styles of rooms at affordable prices. Need a quick getaway? Book one of our Jacuzzi Suites to find some extreme relaxation. Looking for lodgings close to McDaniel College? Hop in the car for a quick 5 minute drive up to the college. Or maybe you’ve been assigned to a construction project in Northern Maryland? We have the perfect location and pricing for long-term stays. Taneytown, Hampstead, Manchester, New Windsor, Union Mills, Union Bridge, Mt Airy, Finksburg, Taylorsville, Eldersburg & Sykesville. 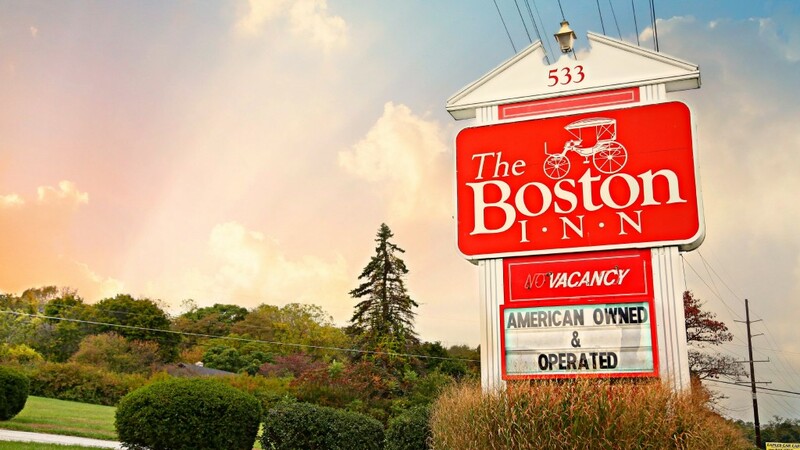 Copyright © 2009-2017 The Boston Inn. All Rights Reserved.